Baseball, Hot Dogs, Apple Pie, and BME? Most BME seniors spend the summer between their junior and senior years interning in biomedical labs and industries to help decide their next step. This summer, D.J. Schwartz also tried on a possible future for size, but not the usual one. D.J. played on a New York Collegiate Baseball League (NYCBL) summer league team that is affiliated with MLB. This league takes students from all different colleges that are standout baseball players for their college. D.J., a BME senior with a concentration in Cell and Tissue Engineering who also is a pitcher on the UR varsity baseball team, spent the summer playing for the Hornell Dodgers. Schwartz says, I had a special role. I was the closer, which meant that if we were winning in a game by less than three runs, I came in and closed the game out in the 9th inning. My experience was great. I got to play with and against some really good baseball players that have a chance of playing at the professional level. We played about 43 games this summer so I was basically playing everyday. D.J. was elected to the All-Star game and led the league in Saves, and had one the lowest ERA 's on the team. 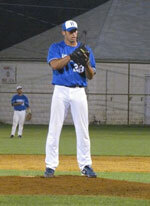 He was named a Top 15 Pro Prospect of the NYCBL, and was also named to the ALL NYCBL 2nd Team.